In a comment on the previous post, Steve P. asked whether “Apatosaurus” minimus might not be a Apatosaurus specimen after all — particularly, an Apatosaurus ajax individual resembling NSMT-PV 20375, the one in the National Science Museum, Tokyo, that Upchurch et al. (2005) so lavishly monographed. 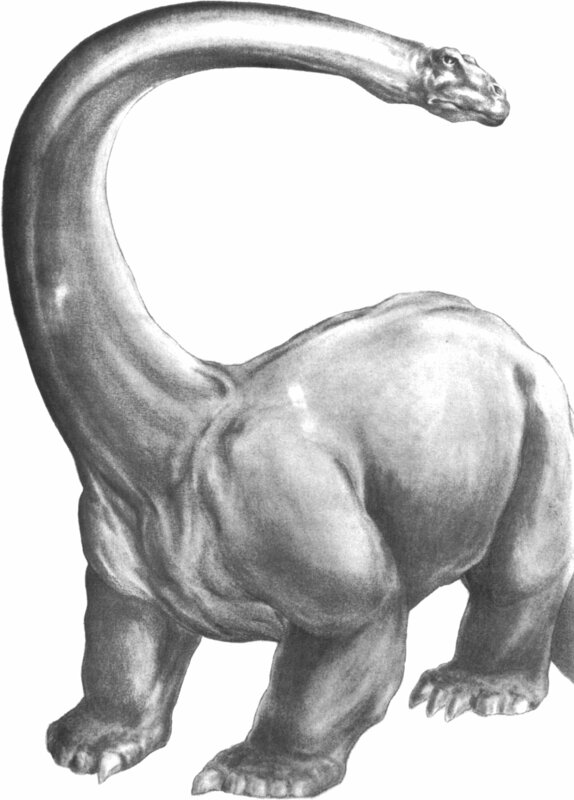 Initially, I dismissed this idea out of hand, because the “Apatosaurus” minimus sacrum-pelvis complex is so very different to that of the “Brontosaurus” illustrated by Hatcher (1903: fig. 4), as seen in an earlier post. But on going back to the Upchurch et al. monograph I realised that their sacrum-ilium complex is very different from Hatcher’s. Here it is, cleaned up from scans and re-composed in the same format as the Camarasaurus and “Apatosaurus” minimus from last time, for easy comparison. 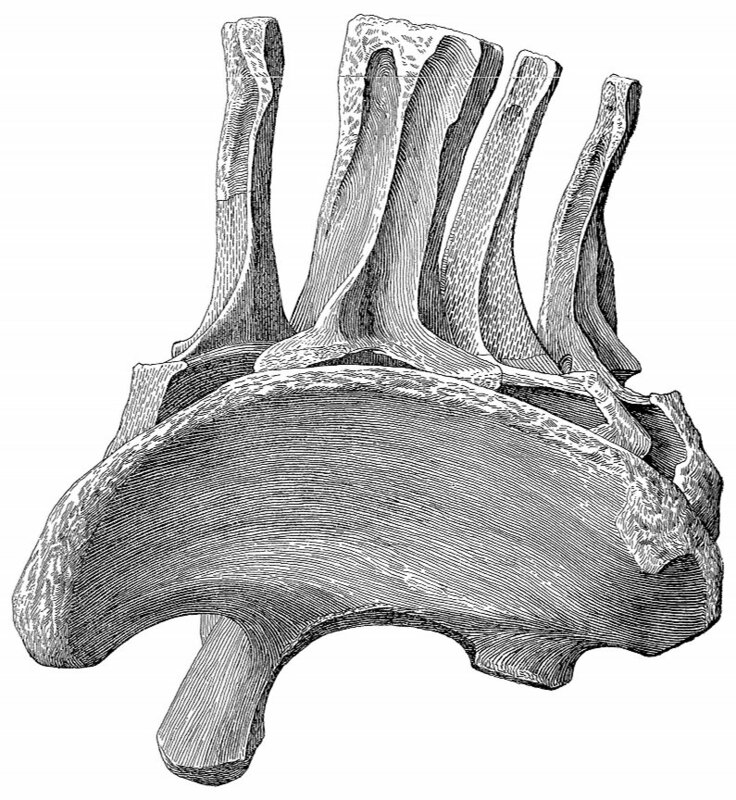 Sacrum and fused ilia of Apatosaurus ajax NSMT-PV 20375. Top row: dorsal view with anterior to left. Middle row, left to right: anterior, right lateral (reversed), posterior. Bottom row: ventral view with anterior to left. Modified from Upchurch et al. 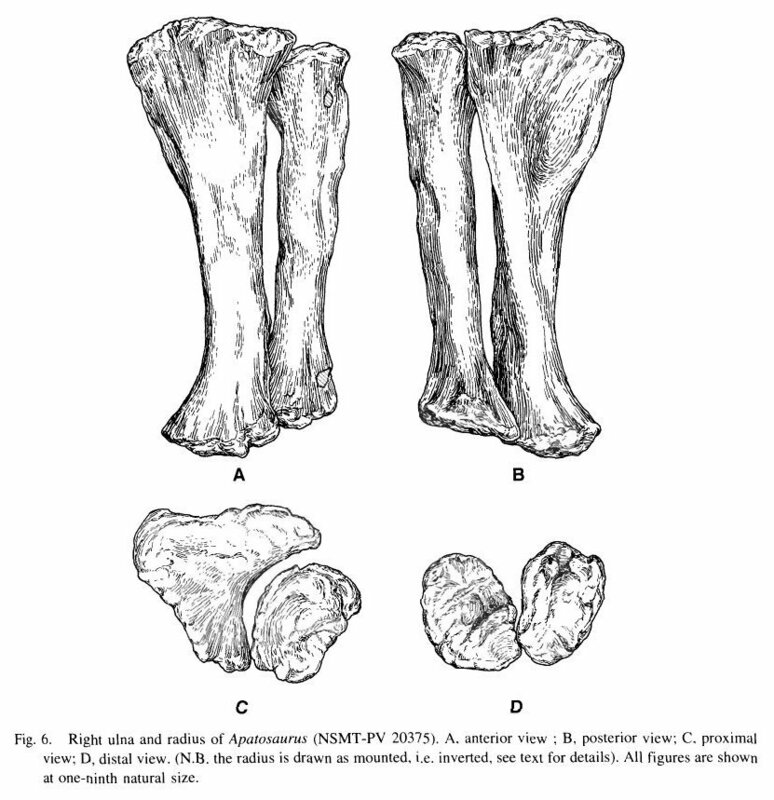 (2005: plate 4 and text-figure 9). I’m not sure what to make of this. The Tokyo Apatosaurus seems to be intermediate in some respects between Hatcher’s specimen and “Apatosaurus” minimus. One important difference is that the neural spines are much taller in Hatcher’s illustration than in the Tokyo Apatosaurus. Could that be ontogenetic? (IIRC the Tokyo individual is subadult). Or are they in fact different species? Or is it just individual variation? Thanks to the wonder of Osborn and Mook (1921), we have already seen multiview illustrations of the pubis and ischium of Camarasaurus. Now we bring you their Camarasaurus sacrum. 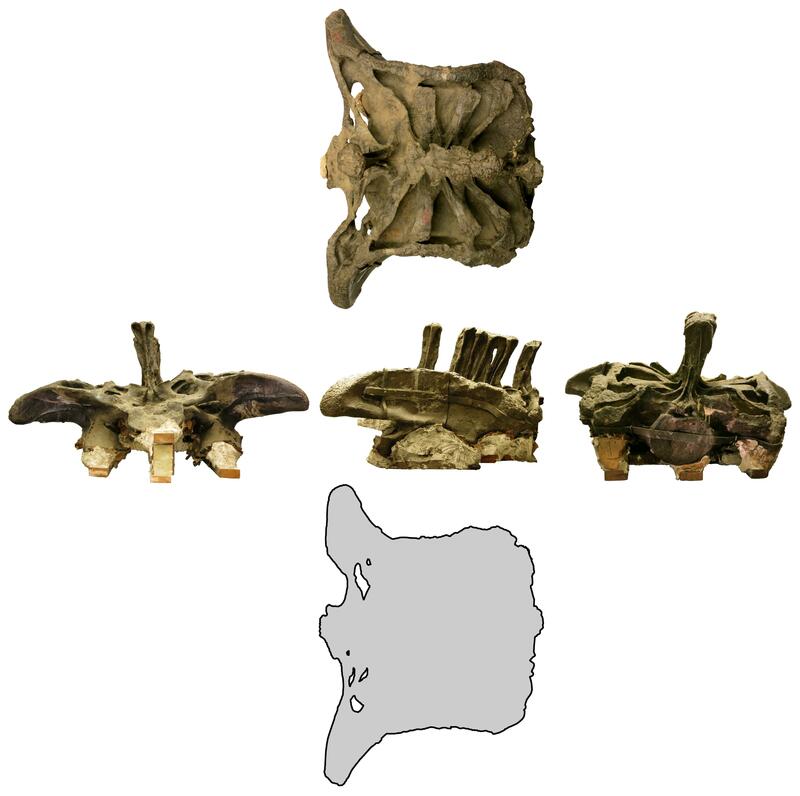 This is the sacrum of Camarasaurus supremus AMNH 5761. Top row: dorsal view, with anterior to left. 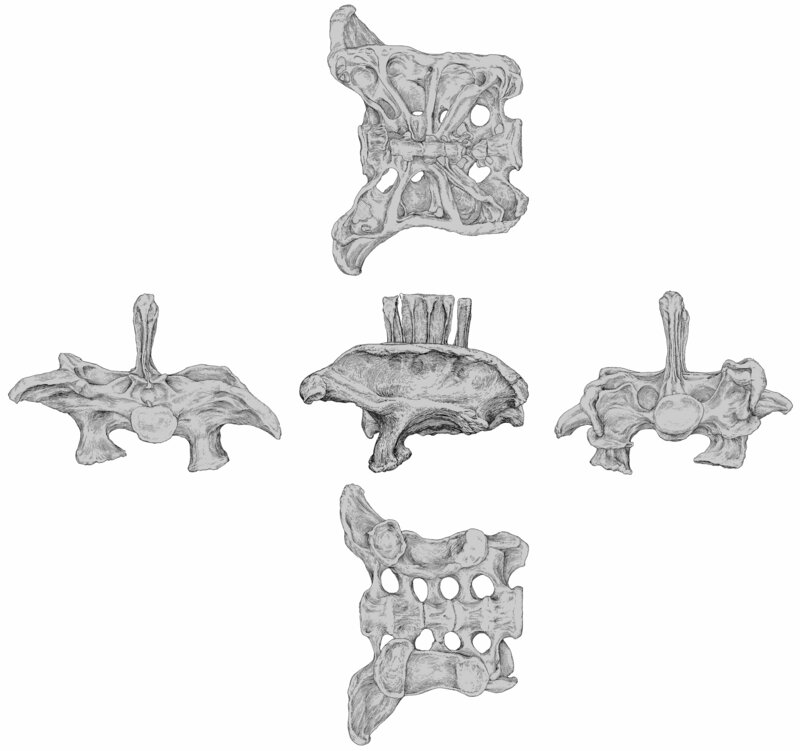 Middle row, from left to right: anterior, left lateral and posterior views. 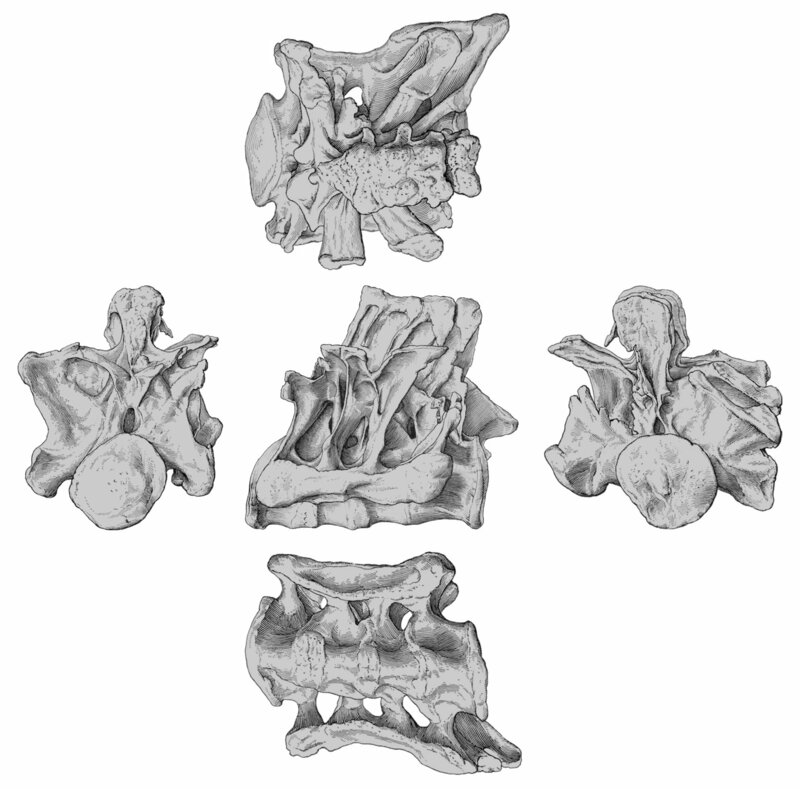 Bottom row: ventral view, with anterior to left. Modified from Ostrom and Mook (1921:figs. 43-44). One thing is for sure: whatever else “Apatosaurus” minimus might be, it ain’t Camarasaurus. Osborn, Henry Fairfield, and Charles C. Mook. 1921. Camarasaurus,Amphicoelias and other sauropods of Cope. Memoirs of the American Museum of Natural History, n.s. 3:247-387, and plates LX-LXXXV. A couple of weeks ago we tried to work out what it costs the global academic community when you publish a paper behind an Elsevier paywall instead of making it open access. The tentative conclusion was that it’s somewhere between £3112 and £6224 (or about $4846-9692), which is about 3.6-7.2 times the cost of publishing in PLoS ONE. That calculation was fraught with uncertainty, because it’s so difficult to get solid numbers out of Elsevier. So let’s try a simpler one. The annual revenues generated from English-language STM journal publishing are estimated at about $8 billion in 2008, up by 6-7% compared to 2007, within a broader STM publishing market worth some $16 billion. There were about 25,400 active scholarly peer-reviewed journals in early 2009, collectively publishing about 1.5 million articles a year. 8 billion dollars divided by 1.5 million articles yields a per-article revenue to the STM industry of $5333. And since publisher revenue is the same as academia’s expenditure on publishing, that is the per-article cost to Academia. What can we make of this $5333 figure? For a start, it’s towards the bottom of the $4846-9692 Elsevier range — only 10% of the way up that range. So the balance of probability strongly suggests that Elsevier’s prices are above the industry-wide average, but not hugely above — somewhere between 10% below and 80% above the average. More importantly, each paywalled article costs the world as much as four PLoS ONE articles. 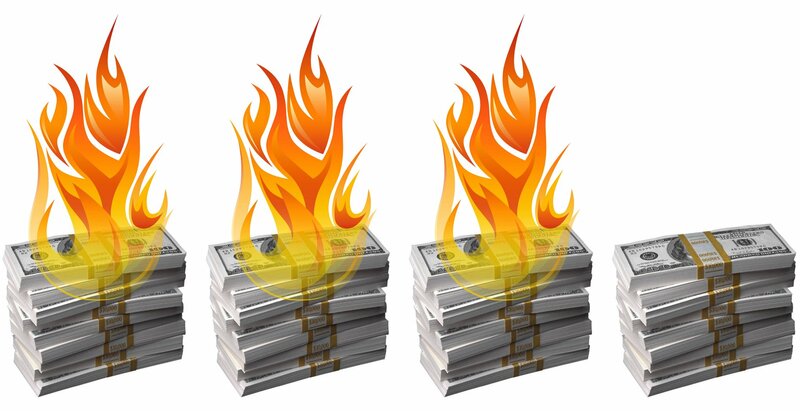 In other worlds, if we all stopped submitted to paywalled journals today and sent all our work to PLoS ONE instead, the total scholarly publishing bill would fall by 75%, from $8 billion to $2 billion. Why am I comparing with PLoS ONE’s $1350? There are other comparisons I could use — for example, the average cost of $906 calculated by of Solomon and Björk across 100,697 open-access articles in 1,370 journals. But that figure is probably propped up by journals that are deliberately being run at a loss in order to gain visibility or prestige. PLoS ONE is a more conservative comparison point because we know its $1350 is enough for it to run at a healthy operating profit. So we know that a switch to PLoS ONE and similar journals would be financially sustainable. But there’s certainly no reason to think that PLoS ONE’s price of $1350 is as low as you can go and still have good-quality peer-reviewed gold open access. For example, PLoS ONE’s long-time Editor-in-Chief, Pete Binfield, thinks that it can be done, at a profit, for $99 — a staggering 92% price-cut from the $1350 figure we’ve been using. If he’s right — and he’s betting his mortgage that he is — then we could have 54 per-reviewed articles in PeerJ for every one that goes behind a paywall. It’s too early to know whether PeerJ will work (and I’ll talk about that more another time). But the very fact that someone as experienced and wily as Binfield thinks it will — and was able to attract venture capital from a disinterested and insightful party — strongly indicates that this price-point is at least in the right ballpark. Which is more than can be said for the Finch Report’s ludicrous over-estimate of £1500-£2000. Mathematician David Roberts has pointed me to a useful new five-part series by Martin Paul Eve, entitled Starting an Open Access Journal. It’s well worth a look, for how it engages with so many practicalities and how tractable he makes it all seem. Part 1 — planning and social issues. Incredible. We knew the tide was turning, but who saw it turning this swiftly? 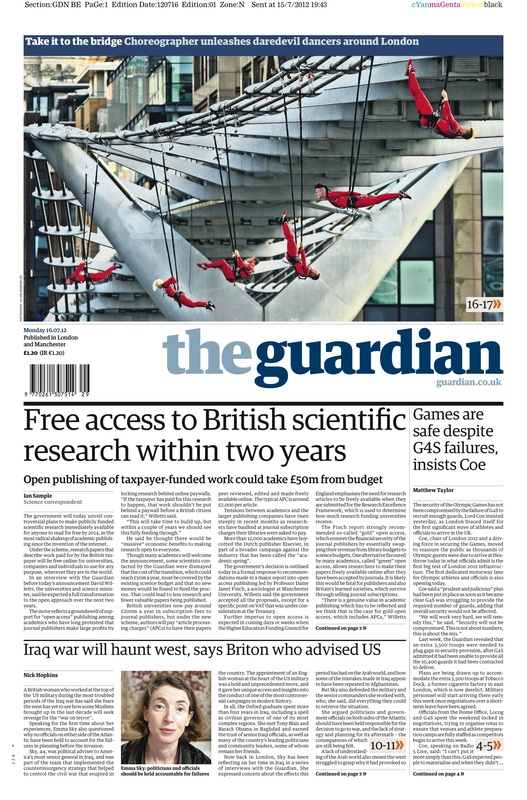 The full story is on the Guardian web-site. More information, and useful links to exactly what the Government said, on the Nature News blog. How fat was Brontosaurus? Well, not this fat, anyway! It’s by Kenyon Shannon, found on page 14 of The How And Why Wonder Book of Dinosaurs (Geis 1960). I call it Brontosaurus rather than Apatosaurus because this outdated rendition is forever tied to the outdated name in my mind. It would be terribly easy to pick holes in this representation — the completely wrong head, the bizarre croc-like eyes, the incorrect attitude of the head, the tubular shape and much too thin profile of the neck, the full set of manual unguals and so on. But the part that’s most shocking to me is just how darned fat it is. 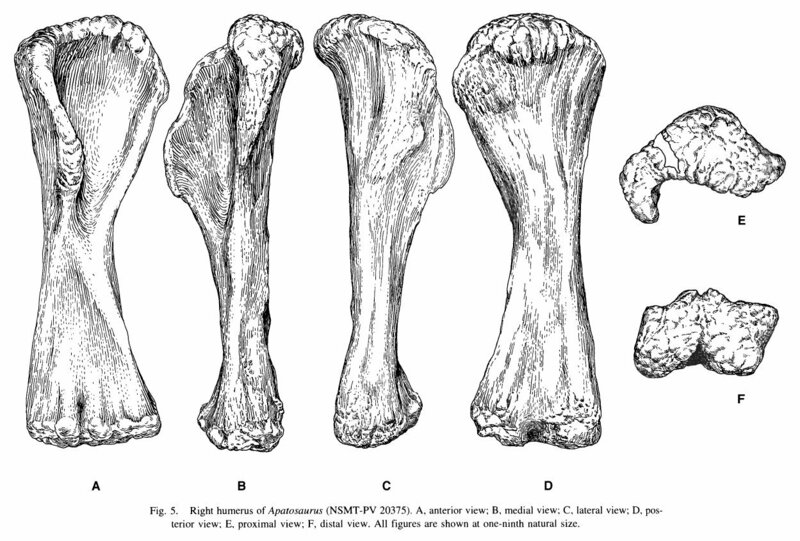 Right forearm of Apatosaurus ajax NSMT-PV 20375. A: “anterior” (more like anterolateral) view with ulna to left, radius to right; B: “posterior” (more like posteomedial) view with radius to left, ulna to right; C; proximal view; D: distal view. In short: it’s a solidly built animal; but the Shannon depiction that we started with is not merely solid, it’s what we refer to as “a lardy bloater”. Just say no. Geis, Darlene. 1960. The How and Why Wonder Book of Dinosaurs. Price Stern Sloan, Los Angeles. 48 pages. ISBN: 0-8431-4250-2. Upchurch, Paul, Yukimitsu Tomida, and Paul M. Barrett. 2005. A new specimen of Apatosaurus ajax (Sauropoda: Diplodocidae) from the Morrison Formation (Upper Jurassic) of Wyoming, USA. National Science Museum Monographs No. 26. Tokyo. ISSN 1342-9574. 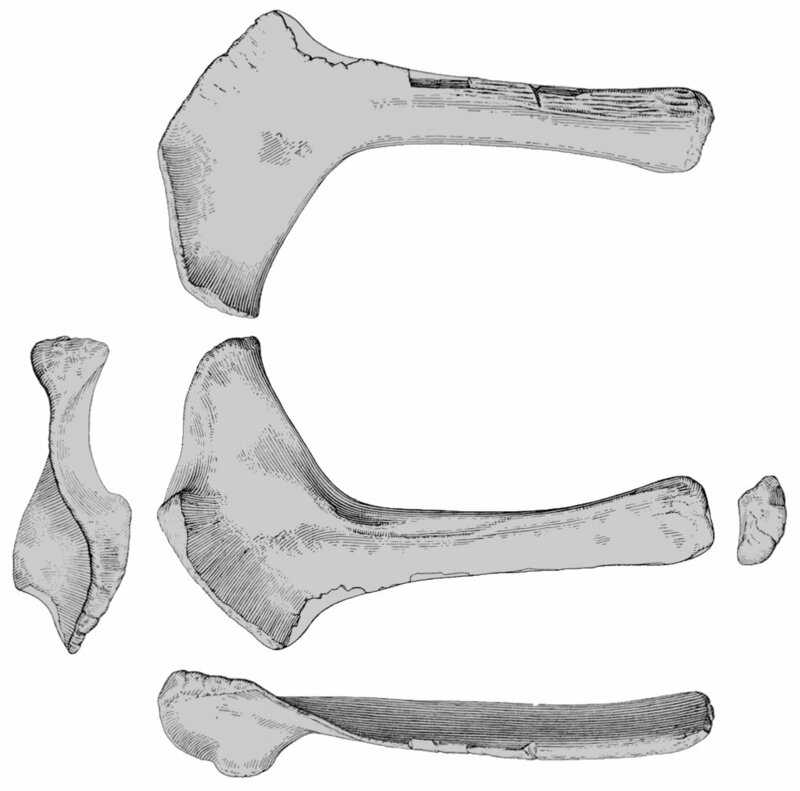 This shows the left ischium AMNH 576o’/Is.4. Left column: proximal aspect. Middle column, from top to bottom: medial, lateral, posterior (no dorsal view was provided). Right column: distal. Heavily modified from Osborn and Mook (1921: fig. 101) — cleaned up, lettering and lines removed, recomposed in a more informative layout, views rescaled to better match each other, and tweaked for colour. As usual, click through for full resolution (only 989 x 978 this time). It’s interesting to compare this with the similarly composed illustration of the “Apatosaurus” minimus ischium from last week.